Nepal has long been known as the rooftop of the world, home to 8 of the 14 largest mountains on the planet, and annually hosting thousands of accomplished and aspiring mountaineers trying to ascend to the greatest peaks on earth, not to mention the tens of thousands of trekkers content just to get a glimpse of the giants. But while Nepal is most famous for it’s heights, it is what is being revealed from inside it’s depths that is bringing a new type of adventurer to the mountains. For two months I have been trekking in Nepal, and I was often humbled and inspired by the amazing mountain views soaring above me. Yet it was the canyons plummeting below me that most often sparked my interest. Countless cascades pour off the huge Himalayan peaks, some forming thundering waterfalls 130 meters high or even higher, while others form more aesthetic, intimate gorges. I constantly wondered if anyone knew what secrets these canyons held. Certainly someone has had to have descended at least a few of these. dear dan it was a great journey to all these canyons and to be in these nice small group AND rajendra took care of us. It’s been long, Hope all is fine and well with you there. 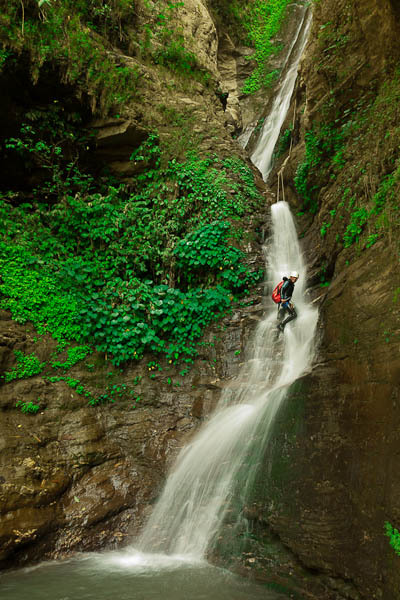 Well, thanks for your nice picture of Nepal Canyoning and we are very happy to saw your pic. Best regards and see you some day soon.